﻿This beauty was resting on the window of my parents kitchen a few weeks back. The Emperor Moth is a day flying moth that can be seen around April and May. It's widespread and locally common but likes to live near boggy habitats where its larvae can find food. According to Collins Complete Irish Wildlife it also likes to feast on brambles! Wishing you a happy weekend and keep an eye out for the little creatures! I just love your idea of Identifriday!! 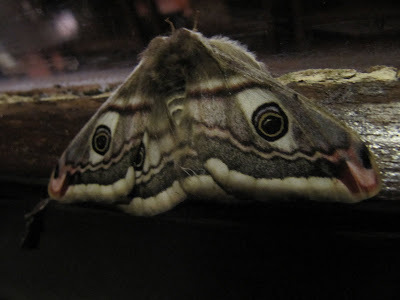 Beautiful emperor moth. We have been identifying moths and butterflies but haven't yet seen anything this month as impressive as an emperor moth. Lovely to come across your blog via Magic Onions.